Hops and Brew Craft Brewery Tours are giving the gift of Brisbane’s best beer, just in time for Father’s Day! This Father’s Day, Hops and Brew are here for the beer lovers of Brisbane, with craft brewery tours as the perfect activity to celebrate. Give the gift of beer to your closest patriarchs, partners, parents or paternal figures – it’s the perfect way to say Hoppy Father’s Day! From the comfort of the signature Hops and Brew chauffeured tour bus, it is a chance to truly enjoy the most exciting craft brews in town; for couples, groups, bucks parties or corporate functions. Not just a celebration for beer aficionados, Hops and Brew Tours are enjoyed by novices and connoisseurs alike. Bonding over sips of Pilsners and Porters, Ales and Stouts, there has been no better time to explore your love of beer this Father’s Day. Hops and Brews are here to give more than just shouting your nearest and dearest a drink this Father’s Day. 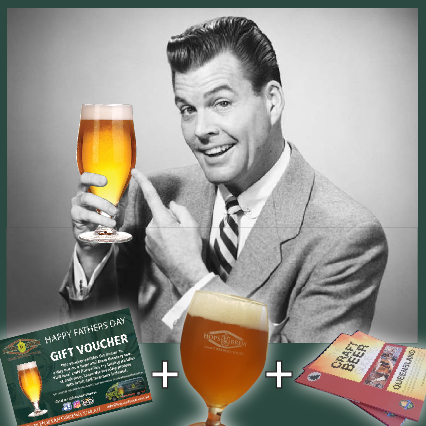 Ordering a gift voucher before 30th August 2018, that someone special will receive a free beer glass and Queensland Craft Beer Guide to enjoy.